Preimplantation genetic screening is a medical test almost same as Preimplantation genetic diagnosis. Only difference between them is that it is conducted for detecting chromosomal aneuploidies whereas the second one is done for single gene disorders. Screening test can also detect translocations of chromosomes and other structural abnormalities in the chromosomes. Aneuploidy is a condition of having abnormal or altered number of chromosomes in a cell. It can lead to death of embryo and recurrent miscarriages. Detecting and avoiding transfer of aneuploid chromosomes can reduce the risk of pregnancy loss and improving chance of conception. The chance of pregnancy loss is increasing with increasing the age. PGS can identify chromosomally normal embryos, so can improve the success of IVF. Embryos with correct number of chromosomes can be transferred to the uterus. PGS is usually performed in the patients who are at an increased risk of pregnancy or having repeated IVF failures. Cells are needed to extract from the embryo for its genetic analysis. 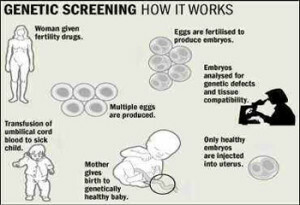 The test can be carried out on the cells of embryo at different stages of development. Unfertilised eggs: Here polar bodies are collected and examined instead of embryonic cells as embryo is not developed here. Blastocysts: 5-6 days after fertilization. There will have many cells in this stage. Then the collected sample is submitted for genetic analysis. It can produce millions of copies of a specific DNA collected from the embryo. The large sequence of DNA is then tested for genetic abnormalities. It can detect and locate a specific DNA sequence on a chromosome. The embryo biopsy is fixed onto a glass slide and using various fluorescent probes it is treated. These probes are specific for the genes within a chromosome. These can be detected using fluorescent microscopy. Using this FISH technology, chromosomal abnormalities and genetic disorders can be identified.